Consumer sentiment in Germany was divided in April. While the overall economic outlook was viewed more optimistically, the high level of income expectations dropped slightly, and willingness to buy saw significant losses. Following a revised value of 5.8 points in April, the overall indicator is forecasting a value of 5.6 points for May. Consumers are evidently coming to the realization that a recession in Germany can be prevented, and the forces which boost the domestic economy are increasingly gaining the upper hand. As a result, the economic expectations have risen for the second time in a row. In contrast to this, increasing concerns about inflation are weakening consumer optimism, as shown by the decrease in willingness to buy. Consumers see their buying power as being primarily affected by the increase in energy prices. This is shown by the slight drop in income expectations. As in the previous month, the economic expectations in April increased by 1.3 points. Following this second consecutive rise, the indicator is now at 8.5 points. Following the short weak period in the last quarter of 2011, consumers see the German economy as being back on track for recovery. After the second rescue package for Greece was agreed, calm was restored to the financial markets, at least temporarily. This meant that the factors contributing to the economic upswing such as an extremely stable employment market and German companies’ excellent competitiveness can come through more and more, according to consumers’ estimates. The German economy continues to show great resilience to the spreading trend towards recession in the eurozone. The recent unrest on the stock markets caused by the French elections and the collapse of the Dutch Government are not yet taken into account in this survey. Companies share the assessment of a robust German economy, shown in the fact that the ifo business climate improved in April for the sixth time in a row. Following a significant decrease in the previous month, income expectations in April of this year saw further slight losses: the decrease is currently 1.3 points. Nevertheless, at 33 points the indicator remains at an extremely good level. Constant reports about new record prices at the petrol pumps in Germany are having an effect on consumers. Concerns about inflation are increasing as a result. Consumers view their purchasing power as being compromised, as an ever greater proportion of their income is spent on energy, particularly on petrol and diesel, and is therefore not available for other purchases. This development in the energy sector will presumably not be without consequences for the cost of living in Germany this year. The recently published spring report by research institutes now assumes that the inflation rate will, on average, probably not drop below the 2% mark as predicted at the end of last year, but will be 2.3%. This will mean that the increase in real income which is expected in the upcoming wage negotiations will be lower. The most significant losses in April were seen in willingness to buy. After a slight decrease last month, the indicator lost 11 points in April. However, it is currently at 27.6 points, which is still a good level. In comparison with the corresponding period in the previous year, the decrease is now just less than 7 points. Increased price expectations showed a greater effect on consumer tendencies in April of this year. This means that they are currently overshadowing the continuous positive effects of the employment market development. Increased employment and the associated decrease in unemployment remain a major boost for the purchasing sentiment in Germany by providing planning security for consumers, which is a major factor in making large purchases. Another reason for the weak consumer sentiment may be that consumers’ tendency to save has increased due to the current concerns on the financial markets in April. Distrust of the stock markets has decreased slightly. This means that in the eyes of private households, investment may once again be preferable to making large purchases. The overall indicator is forecasting a value of 5.6 for May 2012 following a revised figure of 5.8 for April. This means that the consumer climate has decreased for the second time in a row. Nevertheless, consumer spending by private households this year was an important boost for the overall economic development. Against the backdrop of a potential weak development in exports, it is even more important to avoid a recession in Germany. If the employment market continues to develop as positively as is currently being forecast, it can be assumed that the consumer climate will be able to develop in an overall stable manner in the coming months. There are no fears of a slump. GfK is therefore improving its annual forecast with an increase in private consumption in real terms of 1%. This, however, is on the condition that the financial and economic crisis does not flare up again, but that the calm continues. These findings are extracts from the “GfK consumer climate MAXX survey”, which is based on around 2,000 consumer interviews conducted each month on behalf of the European Commission. The report contains charts, forecasts and a detailed commentary regarding the indicators. In addition, the report includes information on proposed consumer spending in 20 different areas of the consumer goods and services markets. The GfK consumer climate survey has been conducted since 1980. GfK is one of the world’s largest research companies, with more than 11,000 experts working to discover new insights into the way people live, think and shop, in over 100 markets, every day. GfK is constantly innovating and using the latest technologies and the smartest methodologies to give its clients the clearest understanding of the most important people in the world: their customers. In 2011, GfK’s sales amounted to EUR 1.37 billion. For further information, visit our website: www.gfk.com. Follow us on Twitter: www.twitter.com/gfk_group. GfK is one of the world's largest research companies, with more than 11,000 experts working to discover new insights into the way people live, think and shop, in over 100 markets, every day. GfK is constantly innovat-ing and using the latest technologies and the smartest methodologies to give its clients the clearest understanding of the most important people in the world: their customers. 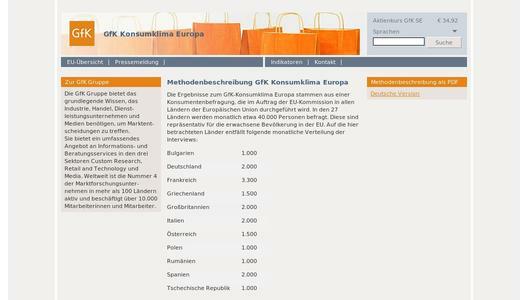 In 2011, GfK's sales amounted to EUR 1.37 billion.